A few weeks ago, I attended the annual SIGCSE (Special Interest Group, Computer Science Education) conference in Raleigh, NC. Google has been a platinum sponsor of SIGCSE for many years now, and the conference provides an opportunity for thousands of CS educators to come together, share ideas and work on significant challenges that have emerged over the last five years. Five years ago, the Advanced Placement Computer Science course and exam almost died. Due to lack of student interest, the B part of the AP CS was discontinued and there was a risk that the A part would also be discontinued. 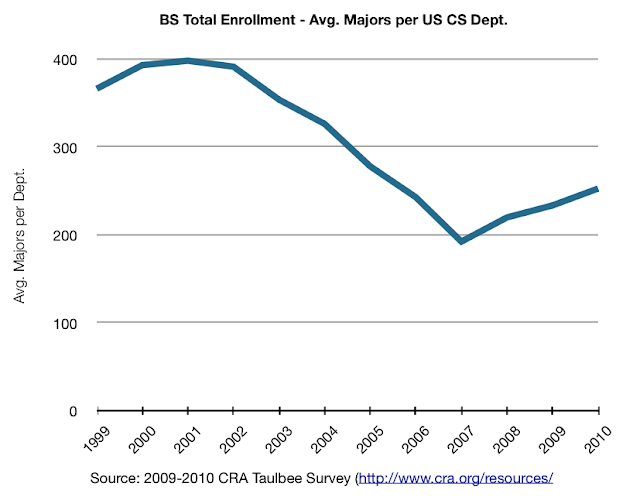 At that time, the number of CS majors at the undergraduate level also hit an all time low. Specifically, the number of students taking the AP CS exam fell 15 % between 2001 and 2007, and the number of college freshmen intending to major in CS plummeted more than 70% during the same period. This was a paradox for CS educators. They knew (and know) that advancing U.S. students' understanding of the principles and practices of computing is critical to developing a globally competitive workforce for the 21st century. Rather than be defeated, a commission of ten secondary and higher education faculty came together and used this as an opportunity to reinvigorate interest in CS. They re-invented the AP CS into a course that not only introduces students to programming, but also gives them an understanding of the fundamental concepts of computing, its breadth of application and its potential for transforming the world. The NSF generously funded the development and piloting of this new CS Principles course two years ago. This academic year, the NSF has funded several high school pilots as well. The pilots have been so successful that the College Board has now committed to developing a new state-of-the-art exam for the course. This is a critical accomplishment. The AP CS is the only standardized computing course we have in high school. The high school curriculum is packed—it’s nearly impossible to get any new course from any domain into the curriculum, and the AP CS is our stake in the ground. Concurrent with the AP CS development, the ACM has pushed forward on two fronts that are also making significant impact. The CSTA (Computer Science Teachers Association) now has 11,000 members with 2300 College Board-certified to teach the AP CS Part A (which is still being offered). Membership and interest is rising, and this community plays a key role in professional development, CS standards definition (another critical stake in the ground) and scaling of the new AP CS. In addition, we have the Computing in the Core Coalition, which is a non-partisan advocacy group of associations, corporations, scientific societies and other nonprofits that is working to elevate CS to a core academic subject in K-12 education. The Coalition does this through advocacy with government agencies and Congress, and by raising general awareness through CSEdWeek. The good news is we are starting to see positive indicators of change. CS majors are rebounding at the undergraduate level. The latest Employment Projections for 2010 to 2020 (Bureau of Labor Statistics) show a 6.9% increase in employment from 2006-2010 in computer and mathematical occupations, and a projected 22.0% increase from 2010-2020. This is in comparison to a 14.3% increase, on average, for all other growing occupations. Of course, we still do not have nearly enough supply coming out of colleges and universities to meet the demand, but the situation has improved in the last two years. We believe that computing and CS are critical to our future, and we support CS education through many programs including CS4HS, App Inventor (just re-launched from MIT), our Exploring Computational Thinking curriculum, and other outreach programs and partnerships. Computing is at the foundation of all things technology, and computer science is at the foundation of computing. The Fusion Tables team has been a little quiet lately, but that’s just because we’ve been working hard on a whole bunch of new stuff that makes it easier to discover, manage and visualize data. A new way to look at your Fusion Table - Try the “Experimental” version of our Fusion Tables web application. The new design helps you explore and collaborate better on data. 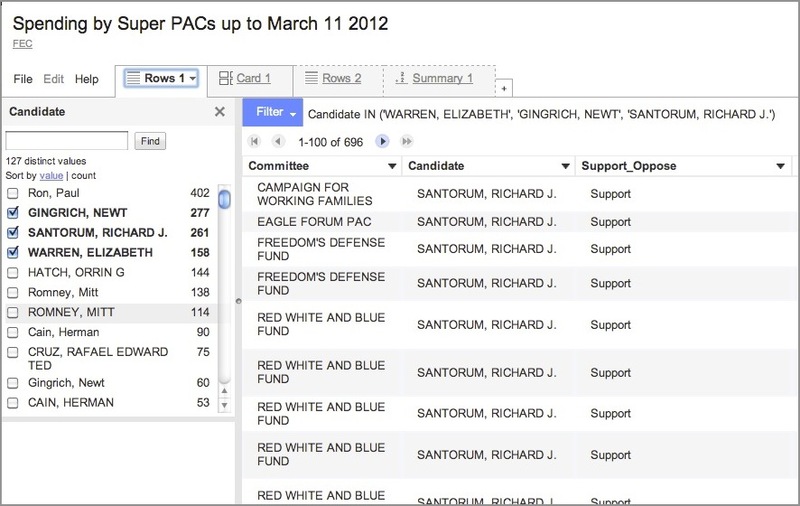 Faceted search make it easier to dive into a big data set and specify what you want to see. Multiple tabs let you experiment, trying different views of a table. And the new card layout lets you give a row of data your own custom layout. Give it a spin. More visualizations on lots of data - People love using Fusion Tables to put data on a map, but there are new visualizations available in our Experiment menu.Try the Zoomable Line chart. Playing with social network data? 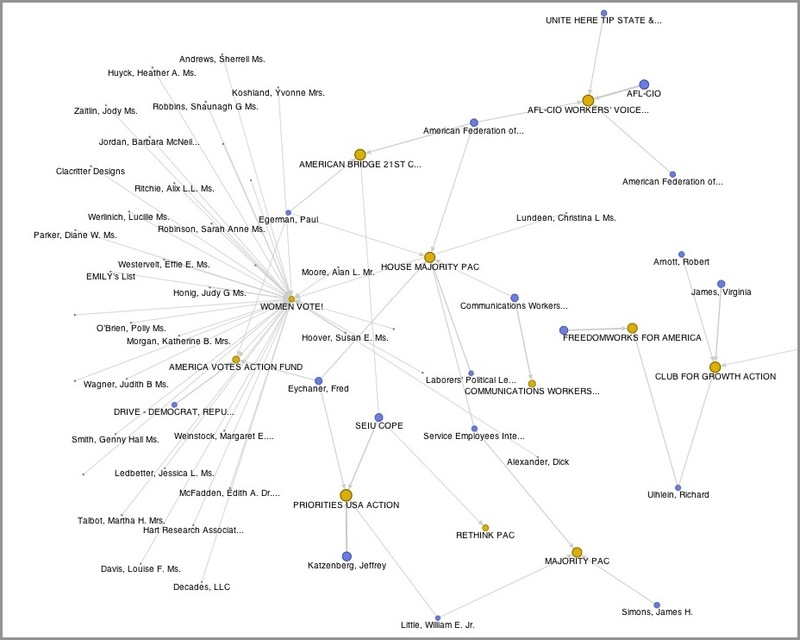 Try out the Network Graph visualization. New open-source tools library welcomes your contributions - Fond of Fusion Tables Layer wizard? Just recently discovered the chart creator? These great point-n-click tools and more for working with Fusion Tables are now available in the Fusion Tables open source library. Please contribute your tools and enhancements! You’ll notice a bunch of our new things are “Experimental”....that’s because we need you to use them and tell us what you love and what could be better. But we didn’t want to keep them secret any longer! On behalf of the Fusion Table team, thanks for all you do with Fusion Tables, and we’re looking forward to hearing your thoughts and feedback.